KORIYAMA, Fukushima － Actor Toshiyuki Nishida, a native of Koriyama, stated his resolve to act for Fukushima Prefecture at a recent ceremony when he received an honorary citizenship award. At the award ceremony in Koriyama on Sept. 17, Nishida received a certificate and a memorial bowl from Fukushima Gov. Masao Uchibori. "With this award, I want to take time again to think about Fukushima and continue to live as an actor who expresses something about Fukushima," Nishida said. The award ceremony was open to the public for the first time and about 300 people attended to honor Nishida, 70. 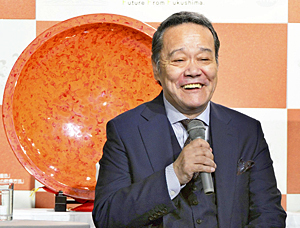 During the ceremony, Uchibori held a talk with Nishida in which the actor discussed several topics, including his hopes for the revival of his hometown. Nishida recalled swimming in the Abukumagawa river when he was young, and his adoptive father, who was fond of the cinema, often took him to the movie theater. "Movies and Koriyama's nature shaped my sentiments, which encouraged me to be an actor," he said. "I had optimistic, bright ideas thanks to the character of Fukushima's people and its local areas, which raised me with generosity." Nishida also talked about his move to Tokyo at 15. "I went to Tokyo to learn the language," he said. "I wanted to be 'bilingual,' not just speak the Koriyama dialect. When I became 'bilingual' at last, I was able to take a step forward." During an interview with the press after the ceremony, he mentioned popular singer Namie Amuro, who recently retired. He said that when she received an honorary citizenship award from Okinawa Prefecture, he thought he also had a chance. Nishida used the word "Amurer," which refers to Amuro fans who emulate her fashion style, saying, "'Toshirers' or 'Nishirers' also exist, though there aren't as many as the Amurers. Those supporters made it possible for me to get this award," he said, drawing laughter from those in attendance. Nishida debuted as an actor in 1967. Since the 2011 Great East Japan Earthquake, he has worked toward helping the region's reconstruction. For example, he encouraged young people as a member of the Futaba School Project, a support group for Futaba Future High School in the coastal town of Hirono. Nishida also appeared in the music video "MIRAI 2061" that depicts Fukushima Prefecture 50 years after the disaster.